Lesson 2. Using regulated stitching – training mode. Lesson 3. Using regulated stitching. Lesson 4. Using Constant speed with and without motion detector feature. The IntelliStitch is a motor controller installed on your quilting machine. It consists of a computer board mounted inside your machine, front and back control panels and handle switches, two track sensor wheels and a needle position sensor. The track sensors measure the changing position of the needle as the machine is moved. The needle position sensor recognizes if the needle is up or down. The stitching mode and other commands are set on the control panel. The controller uses all this data to determine when a stitch should be completed and then sends a command to the motor. If the data in one block is detected as being corrupted, the other block will be used. If the data in that block is corrupted, four beeps will sound and the factory default settings will be restored. This happens very rarely but if it should, then the adjustment procedure should be followed. All the controls are active on both sides of the machine. You can make a single stitch, position the needle, turn the laser on and off and operate the thread cutter or channel lock, if you have those features, from both sides. However, when the black start/stop button is pushed on one side, the controls on the other side will be disabled, with the exception of the black start/stop button that acts as an emergency stop. The type of stitching is determined by how the dial is set on the side where the start/stop button is pushed. It is important to always glance at the control panel before you start sewing to make sure it is set correctly. This is especially important if you move from one side of the machine to the other. The “ON” light indicates when the main power to the machine is on. The "RUN" light indicates that the machine is armed and ready to sew. The light flashes when the machine has not been moved for 4 seconds. The dial in the center is where you choose which stitching mode you want to use. The left side of the dial is for regulated stitching and is marked “STITCHES PER INCH”. The right side of the dial is for constant speed stitching and is marked “STITCHES PER SEC.”. The "FAIL" light serves as a warning light. If it flashes when you are using regu-lated stitching mode, it is indicating that the stitches have reached twice the chosen length and you are moving the machine too fast. It will be continuously lit when the controller de-tects a needle jam. The "DOWN" button is for setting the needle down in the fabric before you start to sew. The “CTRL” button controls your existing thread cutter if you have an APQS, or your existing channel lock if you have a Gammill. If you have neither a thread cutter nor a channel lock, you will not have this button. The “LASER” button turns your laser pointer on and off. The light above this button will flash continu-ously when you are in the setup or adjustment mode. This is the black button on the handle. It needs to be held down for about a sixteenth of a second to either start or stop the machine. The machine is protected from accidental starts triggered by a noise spike on the power line or an accidental hit of the start/stop button. This is the red button on the handle. If you continue to hold down this button after one stitch has been made, the single stitch will be repeated until the button is released. NOTE: when the needle positioner is set in the down position, the single stitch is inhibited and a beep will sound when the single stitch button is pushed. If you purchased a new laser or laser end conversion, you can change the size of the laser light dot by turning the red end of the laser. To change the brightness of your new or existing laser, use a small screwdriver to turn the white screw-head just above the place where the laser plugs into your machine. This increases or decreases the brightness. It should be just bright enough for you to see. The regulated stitching mode is selected when the selector dial is set anywhere between the B1 and S markers at the moment when the black start/stop button is pushed. Although the selector dial is continuous, there are only seven discreet settings in the regulated stitching mode. B1 and B2 are basting stitches, useful if you float mount your quilts or do basting for hand quilters. You can choose 6, 8, 10, or 12 SPI for your usual quilting. “S” should be used for very small stippling and other fillers. It is approximately 16 SPI but is not as accurate as the other stitch lengths. This is due to the frequent speed and direction changes of small fillers. The short stitch length gives very smooth, small curves. The notch on the dial should be aligned with the SPI (Stitches Per Inch) marker lines. If the notch is set, for example, between the 10 and 12 markers, the setting will NOT be 11 SPI, but 10 or 12, depending on which marker is closer to the notch. Similarly, if the notch is set between the stitch regulator and the constant speed scales, no selection will be made and a beep will sound indicating that the notch on the dial is not at a definite position. In regulated stitching mode the motor will not start when you press the start/stop button, only the green run light will come on indicating that the machine is "armed". The motor will start when you move the machine and will continue to “fire” stitches, according to the preset stitch length, until you stop moving the machine or you press the start/stop button. If you pause while stitching and do not press the start/stop button, the needle will be pulled up and the machine will stay armed for 8 seconds. The motor will start when the machine is moved again. If you pause for the full 8 seconds, the green run light will begin to flash after 4 seconds and the machine will disarm itself after 4 more seconds. This is a safety feature. The flashing light will catch your eye and remind you that the machine is armed and will start to sew if it is jogged by accident. You should keep your fingers away from the needle when the machine is still armed but not moving. When the machine disarms itself, it will sound one beep. Every time a stitch gets longer than twice the selected length, the red FAIL light will be turned on and a beep will sound. This long stitch indication is turned on not only when you move the machine too fast, but when there is a sudden speed change, usually at corners or points in a pattern or when you first start off. You may find that you get some long stitches at first because you are used to moving quickly through points and at start off in order to prevent a build up of stitches. We recommend that you use the training mode when you first get your I/S so that you can become proficient at moving your machine with a more natural motion using minimum effort. You will not have to force your machine to quickly change direction anymore, you will be able to simply guide it. We do not recommend winding bobbins with your on board bobbin winder while you are quilting in regulated mode as pausing and changes in speed can cause the bobbins to wind unevenly. For best results, you should set your machine to constant speed for winding bobbins. This operates in exactly the same way as the regulated stitching mode but it has added beeps to help you move the machine correctly through changes in direction and points in order to eliminate long stitches. The long stitch indication does not work in this mode, instead the machine will beep at points or sharp change in direction when you are moving the machine correctly. Your goal is to hear a beep at every point when in training mode. Before your machine was converted, it only operated on constant speed, which meant that you had to move quickly through points and sharp changes in direction in order to prevent a build up of stitches. That is an unnatural way to move. It is more natural to slow down into and pull out gradually from a point. That is exactly the way you need to move your machine now that it has the I/S. Some quilters find that they do this movement naturally, but others will need to re-train themselves. It requires very little effort to move your machine this way and the beep of the training mode will help you understand when you are moving correctly in order to get the best regulation. To exit the training mode, you should hold the “Down” button as you power up the machine. If you want to return to the training mode, turn off the machine then hold the “Down” button as you power up again. The machine will remain in the chosen mode until you change it. In other words, if you were in training mode when you turned off your machine for the day, it will still be in training mode when you power up the next day. You know you are in training mode when you see the “Down” light flashing during power up. Training mode is not active in B1, B2 or 6 SPI. The constant speed mode is selected when the dial is set anywhere between 1 and MAX at the moment when the black start/stop button is pushed. When you press the start/stop button the machine will begin sewing immediately, just as it did before the I/S was added. However, if you choose needle down the machine will lift the needle out of the fabric before starting to sew. You need to wait for this needle pull up to be completed before moving the machine. When the dial is set between 1 and 10, the machine will run in a pulsed mode. This is the no-drag slow speed and is a unique I/S feature. It eliminates needle flexing and fabric stretching which happens at extremely slow constant speed. 1 is the slowest speed and here the machine will take one stitch per second regardless of how fast or how slowly you move your machine. At 10 the machine takes 10 stitches per second. Above 10 the motor runs continuously, with variable speed, determined by the dial setting. If you use your on board bobbin winder, you should use constant speed to fill your bobbins. This may mean that you have to stop quilting in regulated stitching mode then move your machine away from your work to fill a bobbin. You should remove the bobbin case and unthread the top thread to before the take up lever, then set you dial to constant speed. Of course, if you are quilting in constant speed, you can wind as you quilt. The motion detector feature is an addition to the constant speed mode. When it is enabled, the motor will not start when the start/stop button is pushed. The green run light will be turned on indicating that the machine is armed. The motor will start only when the machine is moved more than 1/16" in any direction, and will run with the preset constant speed, until the machine stops (does not move more than 1/16") for about 1/10 of a second. When that happens, the motor will stop and the needle will be pulled out of the fabric automatically. This is very helpful as it allows you to stop stitching without having to press the start/stop button quickly, which is important when using constant speed. Just as happens when you pause in regulated stitching mode, the needle will be pulled up even if you selected needle down. The machine will stay armed for 8 seconds and the motor will start again when the machine is moved before the 8 seconds is up. If you do not move the machine for 8 seconds, the machine will disarm itself. The motion detector feature can be turned on or off with a simple programming step. Hold the black start/stop button down as you power up. The machine will stay in that mode until you change it. You know whether the motion detector feature is enabled or not by listening to your machine when you power up. If your machine makes one beep at power up, the motion detector is disabled. If your machine makes two beeps at power up, the motion detector feature is enabled. It is important to warm up your machine before set-up or actual quilting as it brings up the motor and electronics to a normal operating temperature. The warm up cycle is started by holding down the laser light button while you press the start/stop button. Three beeps will sound and after a short pause the machine will stitch at a rate of 25 stitches per second with a high powered firing stitch. This happens regardless of which stitching mode you are in or where your dial is set. The machine will beep every 5 seconds while it is in warm up and it will turn itself off after 3 minutes when it will have reached normal operating temperature. You can interrupt the warm up by pressing the start/stop button. To get into adjustment mode, hold down the red single stitch button while powering up. Adjustment can only be done at the back of the machine. The light above the laser button will flash continuously to indicate that you are in adjustment mode. ONE BEEP - motion detector of constant speed disabled. TWO BEEPS - motion detector of constant speed enabled. DOWN LIGHT FLASHING WITH EITHER ONE OR TWO BEEPS - the machine is in training mode. LIGHT ABOVE THE LASER BUTTON FLASHING – you are in adjustment mode. IF ANY BEEPS SOUND OR LIGHTS FLASH OTHER THAN THOSE LISTED HERE, EITHER AT POWER UP OR WHILE YOU ARE QUILTING, GO TO THE HELP SECTION TO FIND OUT WHAT THEY MEAN. This section will not give you definitive instructions on how you should use the different modes of operation of your IntelliStitch. There is no one correct way – each quilter will use the features differently to suit their style. To help you decide how you will use the I/S, follow the series of lessons after the daily maintenance section. Put one or two drops of oil in the bobbin area and at all the oiling points. Put a few more drops in the oil cup (on Gammill machines). When the power is turned on with the main power switch on the back of the machine, the machine will always take one stitch. This is necessary for the needle position sensor to find its "home" position. Before turning on the power check that there is nothing in the way of the needle. To start the automatic warm up cycle hold down the laser button while pressing the start/stop button. It doesn’t matter where your dial is set or which mode you are in. The machine will sound three beeps and pause before starting to stitch at 25 stitches per second with a high powered firing stitch. It will beep every 5 seconds and will automatically turn off after 3 minutes. During this time, the machine will reach normal operating temperature. You can interrupt the warm up at any time by pressing the stop/start button. This is a series of lessons to help you familiarize yourself with your IntelliStitch. The lessons begin by being very detailed in their instructions. As you progress, the instructions become less detailed as it is assumed that do not need to be reminded when or how to tie off your threads or advance and baste the sides of your practice piece. Most of the work is done at the front, or needle side, of the machine. You can repeat the sewing exercises as necessary. These lessons will give you a good start in using the I/S. After completing this series, we recommend that you continue to use the Training Mode until you can hear a beep at every point and know that you are moving the machine correctly. How you eventually use the different operating modes is a decision only you can make. Some quilters use the Regulated Stitching mode all the time, others prefer to use Constant Speed for certain things. There is no right or wrong way to use the features of the I/S. You should use them to suit your style of quilting. LESSON 1. GETTING TO KNOW THE FEATURES OF INTELLISTITCH. If you saw the DOWN light flashing, you are in the Training Mode. Please exit the Training Mode before continuing this lesson. How do you do that? Refer back to the Training Mode section. Every time you power up, the machine will take a stitch. This is simply a self-checking routine. Go to the needle side or front of your machine. Move the machine over your practice piece. Bring the bobbin thread to the top by using the single stitch button. Where is the single stitch button? Read the page with the picture of the control panel if you have forgotten. Hold both thread ends and use the single stitch button to take multiple stitches very close together or on top of one another to secure the ends. To do this, hold down the single stitch button and it will take repeated single stitches until you release it. Set your dial to B1 – what does this mean? Refer back to the section about the Regulated Stitching Mode. Press the start/stop button. Look at the control panel and watch for the green RUN light to come on – when you see it, release the button. The machine is now armed and ready to sew but it will not begin until you move the machine. Sew a line of B1 stitches quite slowly. Stop moving the machine, then press the black start/stop button to disarm the machine. Watch for the green RUN light to go out. Now use the single stitch button to do repeated stitches to tie off the threads. If you have a thread cutter, use it to cut the threads. (Can’t remember which button to press? Look at the control panel picture.) If you don’t have a thread cutter, bring your bobbin thread to the top and cut both threads. Change the dial to B2. What does this mean? Engage the channel lock if you have one that’s controlled by the I/S. “Controlled”, that’s a clue to finding the right button. Sew a line of B2 stitches – do not move the machine fast. Stop moving the machine after about 10 stitches but do not press the start/stop button. The green RUN light is still on so what will happen if you move the machine or even accidentally jog it? Do not move the machine – watch the green light. What happens after 4 seconds? Why? What happens after 4 more seconds? Disengage the channel lock but do not tie off the threads. Turn the dial to 6 – what does this mean? Arm the machine – watch for the green RUN light to come on. Move the machine and sew. After a few inches, pause (stop moving the machine) and change the dial to 10 stitches per inch. Move the machine again. What do you notice about the stitches? Why did they change? Sew a little then pause and disarm the machine. Now set your dial somewhere between 8 and 10 SPI (what does that stand for?) Will your machine stitch 9 SPI? Find out in the Regulated Stitching Mode section. Move your dial to S. What does this mean? Arm the machine and start to sew. Gradually move the machine faster and faster and watch the FAIL light until you see it flash and hear a beep at the same time. Sometimes it is hard to hear the beep. Pause then disarm the machine. Look at your stitches – what was the fail light telling you? Refer back to the Regulated Stitching Mode section to find out. Now you’re going to sew in constant speed. What is constant speed? It is just as your machine worked before you got the I/S. You’d press the button and the motor would run at a constant speed. Where is constant speed on your control dial? Forgotten? Refer back to the picture of the control panel. Do you remember how many beeps your machine made when you turned on the power? If it made two beeps you need to turn off the power and disable the motion detector feature of constant speed. To do this, hold down the black start/stop button while you turn on the power again. You will hear just one beep. This means that the motion detector feature of constant speed is disabled. Return to the front of your machine. Set your dial about two marks higher than 10 towards Max. on the stitches per second side of the dial. Bring your bobbin thread up and secure the ends just as you’ve done before. Now get ready – as soon as you arm the machine, it will begin to sew whether it is moving or not just as it did before you got the I/S. Arm the machine (press the start/stop button) and move your machine straight away. If you want to go faster, turn the dial towards Max. If you want to slow down, turn it towards 1. You can do this while the machine is running. Disarm the machine when you are ready. Set the dial to 1. At this position the machine will sew one stitch per second regardless of how fast or how slowly you move it. This is called no-drag slow speed. Read the Constant Speed section for an explanation. Disarm the machine and tie off your threads. Move the machine off your practice piece. Turn off the power. Now hold down the start/stop button as you turn on the power again. The machine will make two beeps indicating that the motion detector feature of constant speed is enabled. What is this feature? Refer back to that section. Move the machine back to your practice piece and bring the bobbin thread up and secure the thread ends. Set the dial a little higher than 10 stitches per second. Arm the machine – watch for the RUN light to come on. Is the machine sewing? Why not, the dial is set to constant speed? What will happen when you move the machine? Move it and find out. Remember, you are in constant speed so the stitch length depends on how fast you move the machine. Sew a little then pause – what happens? Continue sewing and pausing. Alter the speed of the motor by using the dial. Disarm the machine. Move the dial to 8 SPI (regulated stitching side of the dial). Press the button marked DOWN. What happened? Press it again – what happened? Press the DOWN button to lift the needle up. Take a single stitch. Select needle down again. Now try to take a single stitch – what happened? Why did the machine beep? Refer back to the paragraph about the single stitch button on the page picturing the control panel. Tie off your threads. Move your dial so it is pointing between S and 1 stitch per second. Arm the machine – what happened? Don’t worry, it’s not broken. The beep tells you that the dial is set in a dead spot and the machine doesn’t know what to do – constant speed or regulated stitching? You simply need to move the dial one way or the other according to what you want to do. Get into the habit of glancing at your control panel every time you get ready to arm the machine to make sure the dial is set where you want it. This is especially important when you move from one side of the machine to the other. Move the machine away from the practice piece. Press the LASER button. Go to the back of the machine and make the dot of light bigger then smaller. Adjust it to suit you. (Uh-oh, don’t remember how? Just turn the red end.) Now increase the brightness. You need a small screwdriver. Look for the white screw just above where the light plugs into the machine. Turn the screw to increase or decrease the intensity of the light. It should be just bright enough for you to see. And now some questions to help you remember the features of IntelliStitch. When you power up, what do the beeps mean? One beep? Two beeps? How can you change this? What does the machine always do at power up? How do you take a single stitch? How do you take repeated single stitches? What does SPI mean? What are B1, B2 and S? What is constant speed? Where do you set the dial to sew in constant speed? What is the motion detector feature of constant speed? What indicates that it is enabled? How do you disable it? We recommend using the training mode when you first get your I/S as it is important for you to move your machine correctly to get the best results. If you have been quilting with an unregulated machine for a long time, you are probably skilled at moving off fast and jerking quickly through points to stop that build up of little stitches. With the I/S, you don’t need to do that anymore – in fact you shouldn’t do that because it will result in long stitches as the sudden, fast change in speed will be too hard for the regulator to keep up with. Set your machine into the training mode if it is not already set that way. How do you know if it is in training mode? Power up and watch the DOWN light. If it flashes, you are in training mode. If it doesn’t flash, you need to turn off the power, then press the DOWN button as you power up again. Watch for the flashing DOWN light. You will hear one or two beeps. It doesn’t matter whether you hear one or two for this lesson. Your machine will remain in training mode until you choose to change it at power up. Start at the top left of your practice piece. Set your dial to 6 SPI. Secure the thread ends and sew a wavy or undulating line across the full width of your quilt sandwich. Move the machine at a moderate speed. When you reach the right hand side, make a U-turn and echo the first line about half an inch below back to the left edge. Disarm your machine and change your dial to 8 SPI. Echo again across to the right side and back to the left. Pause there. Do not disarm your machine. Pause once more and change the dial to 10 SPI and continue sewing as before. Pause again and change to 12 SPI and stitch two more lines. Finally pause and change the dial to S and repeat the echoing. Disarm your machine. You have now sewn with all the different sizes of regulated stitches that you might choose when quilting. Look at your lines of quilting. Are all your stitches even or do you have some longer stitches where you started off after a pause? If you see long stitches at that point, you were moving off too fast. When you start out, you need to accelerate slowly. This is quite different to the way you used to move your machine. The next exercise helps you practice this slow start. Set your dial to 6 SPI again. Begin at the left hand side of your piece. This time sew a straight line for about 6 inches then pause. Continue sewing for another 6 inches and pause again. Continue sewing and pausing all the way across and back again to the left side. Now repeat the exercise using all the stitch lengths. If you find that you are still getting a long stitch as you start, try using one hand to gently guide the machine. Use one hand, then the other and then just the fingertips of both hands to gently push the machine. This is quilting with the minimum of effort. Guide the machine gently – do not force it. Since you do not need to keep your finger hovering over the start/stop button ready to press it quickly when you want to stop, you can position your hands anywhere that is comfortable. Set your dial to the stitch length you prefer. Sew a row of clamshells like this. They should be about 2 inches across and nicely rounded. As you come to each point, you should hear a beep. If you do not, you are moving incorrectly. You need to slow down slightly as you go through the change in direction. This is a natural movement – do not force the machine to change direction, guide it. If you heard beeps at every point, well done! If you didn’t, just repeat the line of clamshells, holding your machine gently using its momentum to change direction. If you still don’t hear a beep at every point, don’t worry, go on to the next exercise. This movement can take time to learn. If you are comfortable quilting feathers, try some next. Sew a couple of rows. Remember, your goal is to hear a beep at every sharp change in direction. Sewing this next holly leaf vine is a good test for your change of direction skills. If you hear a beep at every point – very well done! If you quilt with pantographs, go to the back of your machine and choose one with some sharp changes in direction to practice. You will use the control panel at the back so remember to look at it to make sure the dial is set where you want it to be and watch for the run light to come on when you arm the machine. You will also be using your laser light. Do you need to change the size of the dot or its brightness? Do you remember how to do that? After you have sewn some of the pantograph, pause and change the stitch length. At the end of the pass, stop and look at your stitches to see which size you liked the best and how the different lengths affected the look of the pattern. Which looks the best? Did you hear a beep at every change in direction? Now that you have an understanding about how to move the machine correctly, this lesson will help you use the regulated stitching mode without the aid of the training beeps. You need to set your machine so that it is not in the training mode. At the back of your machine, turn off the power. Hold the DOWN button in while you power up. The machine will beep, take a self-checking stitch but the down light will not flash. Go to the front of the machine and bring up the bobbin thread and secure the thread ends. Set your dial to 12 SPI. Stitch in a straight line across your practice piece. Start off slowly and gradually move the machine faster until you see the fail light flash and hear a beep. Sometimes it is hard to hear the beep. Slow down and pause. Disarm your machine and look at your stitching line. What was that flash of the fail light and beep telling you? Start at the left hand side of your practice piece and stitch a row of clamshells as you did in the last lesson. This time there will be no beeps at the points when you are moving correctly. You should hear no beeps at all. Did you hear any? If you did, look at your points – why did you hear a beep? Did you notice the fail light flash? If so, why did it do that? Next quilt some feathers, then a row of the rounded leaves and finally a row of the holly vine. Did get any long stitches? If you didn’t have any at all – congratulations! If you are still getting long stitches, don’t worry. Some more practice will help to eliminate them. You should continue to use the training mode for your general quilting for a while. Set the dial to 6 SPI and sew a small meander – make the stitched lines about half an inch apart. Pause after a little while and change the dial to 8 SPI then continue meandering. Change to 10 SPI and then 12 SPI in the same way and finally to S.
If you have an extended base put it on your machine and get your favorite straight guide, if you have one. One of the advantages of the I/S is being able to sew slowly and carefully, pausing whenever you need to when using guides or templates. Set your dial to the stitch length you prefer. You are going to stitch a zigzag line across your practice piece. It is helpful to start with your needle down when using a guide as this allows you to place the guide next to the foot exactly where you want to start quilting. If you do not have a stitch in the ditch guide, you can use a straight edge to help you sew curves. Hold it gently against your foot and reposition it as necessary when you sew. There is no need to stop moving the machine every time you need to reposition it, just slide it gently to a new position to help the machine move in the direction that you want it to go. It simply means that when you arm the machine, the motor will run at a constant speed. The stitch length will depend on how fast or how slowly you move the machine - just as it was before you got the IntelliStitch. Power up your machine and do the warm up if you haven't already done so today. Did you notice how many beeps the machine made at power up? If it made two, you need to disable the motion detector feature for the first part of this lesson. Do you remember how to do that? Turn off the power, then hold down the black start/stop button while you power up again. You will hear one beep now. To set your machine in the constant speed mode, turn the dial to the stitches per second side. Notice how there are only two numbers. At 1, the machine will sew one stitch per second. As you turn the dial towards 10, the number of stitches will increase until it is sewing 10 stitches per second at the number 10. The length of these stitches is up to you. Set your dial to 1, secure your thread ends. When you arm the machine this time it will start to sew straight away so be ready to move the machine. Since it will only take one stitch per second, you do not need to move off quickly. Move your machine slowly at first, then gradually increase the speed with which you move it to increase the stitch length. This setting is good for doing basting stitches longer than one inch. Sew a line of long basting. Remember that you cannot pause and expect the machine to stop sewing in this mode, so if you want to pause to admire your stitches, you have to disarm the machine. Sew a little at varying speeds from 1 to 10. Remember to move the machine as soon as you arm it. Now turn the dial a little beyond 10 towards Max. There are no numbers here because they are unnecessary. All you need to know is that the motor runs faster and faster until it reaches Max. Your maximum setting may be quite different to someone else's as the IntelliStitch has been customized to suit you. Set the dial at 10. Put the needle down then arm the machine and start to sew. As you go along, gradually increase the speed of the motor by turning the dial. Now sew some designs with the dial set at different points so that you get to know your machine's speed range. Turn off the power to your machine. Hold down the black start/stop button as you power up again. How many beeps did the machine make? It should have made two - what does this mean? Refer to the Quick Guide to the Beep and Light Signals page if you have forgotten. Move the machine back to your practice piece and secure the thread ends ready to sew again. Set the dial to a little above 10 stitches per second towards Max. Arm the machine but do not move it - what happened? Did the machine start to sew? Why not? Now move your machine and sew a little then pause. Move again - remember the stitch length depends on how fast you move the machine. Pause and increase the motor speed with the dial. Sew and pause some more. This motion detector feature makes the constant speed mode a little more user friendly, allowing you to pause as necessary without having to disarm the machine. Since you are now used to being able to pause while using stitch regulation, being able to pause when using constant speed means you do not have to use your pre-I/S technique of disarming the machine quickly to stop sewing. When you feel you have practiced enough in this mode, tie off your threads and move your machine away from your practice piece. Turn off the power. How many beeps will you hear when you power-up again? Unthread your machine back to before the take up lever and take out the bobbin case. Power up again - was your answer correct to the previous question? Based on the exercises here, do you prefer using constant speed with or without the motion detector feature? This final lesson will help you to decide how you will use all the features of IntelliStitch. Every quilter has their own style - some will use the stitch regulator all the time, others may find that they like to quilt certain designs very fast and so constant speed will be best for those. At the other extreme, some quilters may find that they only use the stitch regulator when they are doing careful work where they need control when moving the machine slowly. The way you choose to use the I/S is entirely up to you. Its many modes of operation allow you the freedom to quilt without stress. Remember to glance at your control panel before you start quilting to make sure the dial is set where you want it to be and to check whether it is armed. This is especially important when you move from one side of the machine to the other. Secure your threads at the left hand edge of your practice piece. Set your machine in regulated stitching mode at a stitch length you like. You will sew a straight line across your quilt. (Engage the channel lock if you want to sew a perfectly straight line.) As you sew across the piece, pause at each line. Continue sewing and pausing all the way across. Tie off your threads and go back to the left ready to start again. Finally set the machine in constant speed with motion detector and sew and pause again across the full width of your piece. Tie off your threads and look at the three lines of stitching. Can you see by looking at the stitches where you paused when in regulated stitching mode? How about when in constant speed or constant speed with motion detector? Sew three rows, one in constant speed with motion detector, one in constant speed without motion detector and finally one in regulated stitching mode, No need to keep pausing this time. When you have completed the three rows, look at your stitches. How do the three rows compare? Which mode was the best for you? Did you move the machine too fast for the stitch regulator? Were your stitches even when using the regulated stitching but varied in size when in constant speed? There are no right or wrong answers to these questions - they are simply helping you understand how you will ultimately use the different features of the I/S. Now sew three rows of this zigzag in the same way. Use a guide to keep the lines straight. How did you like sewing this in each mode? Was it easier when regulated stitches? Look at your stitches - which row looks the best and has even stitches? Notice how you had to keep pressing the stop/start button every time you changed direction when using constant speed. Repeat the exercise again but this time sew one of your favorite pantographs. If you do not usually sew pantograph patterns, do three rows of feathers. These four exercises are enough to give you some idea of how you will use the IntelliStitch when working on a quilt. You should now have a basic understanding of how it will work for you and which mode to choose for each type of quilting. However, your choice may change from quilt to quilt and from day to day and will certainly change as your experience and skill in using the IntelliStitch grow. These lessons have given you a good start in using your I/S but don't base your future use of the different modes entirely on this limited practice. Right now you might prefer constant speed just because that is what you are most familiar with. However, you should use the regulated stitching training mode all the time for a while. This will train you in moving the machine correctly for the best results. Sometimes you may move the machine just too fast for the regulator and need to switch to constant speed, with or without the motion detector feature. But by first having tried to use regulated stitching, you will be sure that your decision to use constant speed for a particular design or type of quilting is based on good experience. How do you know when the motion detector is enabled? How do you disable the motion detector feature of constant speed? What does the number 1 on the stitches per second side of the dial mean? What does S stand for and when would you use that setting? How can you sew repeated single stitches? What does your CTRL button do, if you have one? How do you make the laser light brighter? How do you make the dot of light bigger? What does it mean when the fail light flashes and you hear a beep at the same time while you are not using the training mode? What does it mean when you hear a beep at every sharp change in direction when you are using the training mode? When you power up, what does the flashing DOWN light indicate? I need to move my machine off the table – how can I do that? If you need to take your machine off the table, the front carriage sensor wheel needs to be disconnected. Remove the cable from the sensor by disengaging the telephone jack, then unclip the cable from the carriage all the way to the back of the machine. Lift the sensor wheel arms and secure one to the machine and the other to the carriage with a tie wrap or twist tie so that they do not hang free and get damaged. When I set my machine to constant speed and press the start/stop button nothing happens. What’s wrong? You simply have the machine set to constant speed with motion detector. In this mode it will not sew unless you are moving the machine. To disable this feature, turn off your machine then power up again while holding down the black button on the handle. The machine will make one beep indicating that the motion detector is disabled. When I turn on the power to my machine it makes two beeps. Why? This indicates that the motion detector feature of constant speed is active. This means that when you use constant speed, the machine will not sew until you move it. When I turn on the power, my machine makes one beep. Why? This indicates that the motion detector feature of constant speed is disabled. When you use constant speed, the machine will start sewing straight away when you press the start/stop button, just as it did before you got the I/S. I set my dial to S and pressed the start/stop button but my machine just beeped. What has happened? You need to move the dial back towards S. You have set it in a dead spot between regulated stitching and constant speed. My machine is making a knocking sound at the back. Is it broken? The setscrew on your motor pulley is probably loose. Remove the black cover over your belt at the back of the machine. Check the setscrew on the pulley at the end of the motor. It should be tightened down on the flat part of the shaft coming out of the motor. The belt that runs from the motor to the handwheel should be absolutely vertical. It should not be tight between the two pulleys – you should be able to push the belt in about a quarter of an inch on both sides. My machine has suddenly started beeping very fast. What does this mean? This indicates that the front control panel is not communicating with the regulator. Contact your dealer. My machine is making fast double beeps. Why? This indicates that the back control panel is not connected or not communicating. Contact your dealer. I Just powered up my machine and it is beeping continuously and one of the lights is flashing – Help! One of the handle buttons has shorted because it has a bent or broken spring. The flashing light points to the defective switch. For example, if the RUN light on the front control panel is flashing, the front red (single stitch) button is faulty, if the FAIL light on the rear control panel is flashing, then the rear black (start/stop) button is malfunctioning. Contact your dealer. No, this is a tension problem, not an IntelliStitch problem. First make sure that your top thread is threaded correctly. If it is, then thoroughly clean your bobbin case and bobbin assembly. If the tension still looks bad, either tighten the top tension or loosen the bobbin tension. You may need to do both. Only trial and error will show you the right thing to do, but make a note of what you do so that you can keep a record for future reference. You are moving the machine incorrectly. Set it back into the training mode to remind yourself how to move correctly. Remember, use minimum effort to guide the machine – do not move suddenly – relax. IF YOU HAVE A PROBLEM THAT IS NOT ADDRESSED HERE, VISIT THE I/S WEB SITE, WWW.INTELLISTITCH.COM, TO SEE IF YOU CAN FIND THE ANSWER THERE, OR CONTACT YOUR DEALER. 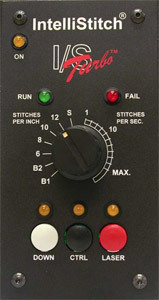 To enter the adjustment mode, hold the RED SINGLE STITCH BUTTON down while powering up the unit. The button should be held down until the machine stops beeping.